Thanksgiving is just around the bend! The smell of turkey roasting, stuffing cooking, yams sizzling, grandma's apple pie sitting on the table, just begging to be eaten. Yes. This is what I have waited for all year...not to mention all 47 of my crazy cousins will be running around, the 14 aunts and uncles catching up and grandpa making the babies cry. 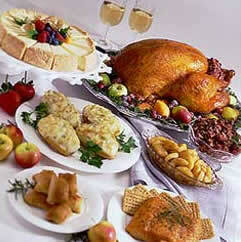 With such a big family, its only natural to have bountiful food during this holiday time. But even small families celebrate Thanksgiving with all kinds of delicious entrées. It's difficult to control yourself and not over eat! But the end of the year is a time to be especially watchful as to what and how much you are consuming. Halloween just ended and everyone is filled up with candy and here comes the feast! 1. Use a smaller plate! If your dish is smaller, you can't get fit as much food. But don't resort to going up for thirds and fourths because of this! Research studies at Cornell University help to prove this actually works. 2. If you absolutely have to have more, allow yourself only seconds...and only seconds of your absolute favorites. Don't bother filling up on foods you don't even enjoy as much! 3. Eat slowly! For several reasons: You won't eat as much, you will be less stressed, have better digestion, among other proven facts. 4. Desserts don't have to be "off-limits." Eating healthy for the whole day, may actually mean a dessert is in your near future! And there are plenty of healthy Thanksgiving recipes out there. 5. Just don't hang out around the food all day! Go sit and talk to everyone in another room before and after the meal, away from the food and resist the temptation altogether. Before we know it, Christmas will be here and it will be a feast all over again! Don't forget all these tips and follow through with them on Christmas Eve and Christmas, too! and boy you do have a big family. Are you a farmer? the smaller plate idea works excellent!